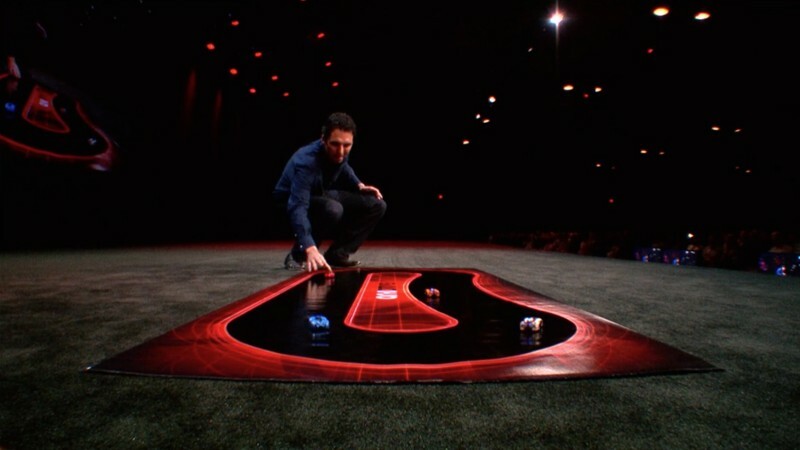 On stage at WWDC today, Tim Cook stepped aside to allow app developer Anki to debut a new product, known as Anki Drive. According to Cook, "Anki uses iOS devices and the iOS platform to bring artificial intelligence and robotics into our daily lives." The product uses smart robotic toy cars powered by Bluetooth to drive on a track. The cars know their location and they are able to react to their surroundings in real time. They can see the track up to 500 times a second to analyze their surroundings and they are equipped to handle a multitude of situations on the printed race track. Players can control the cars via the iPad or the iPhone through an accompanying app. The full Anki Drive experience, which is described as a "video game in the real world," is coming to Apple Stores this fall, while the app is available for download today. The point of this, for those that miss it, is that play like this is what leads to advancements. Self guided robots that can help the elderly and disabled, work in hospitals delivering and cleaning, do janitorial work in offices and factories, do dangerous work, fight wars, etc. Talk about hitting the jackpot. How many developers would have loved to have been picked by Apple to showcase their product at the Keynote at WWDC? I didn't really understand the point of this. They never showed how this connect to iOS. We just saw some toy cars. Toy cars which analyze their surroundings up to 500 times per second and then use that information to decide what to do next. Don't see it as toy cars. They are autonomous, self-driving robotic vehicles operating in real-time. At any given snapshot in time they need to know where they are (presumably using sensors to determine their relative position on the track, though it is possible they have access to the top-view camera for image processing -- I didn't catch the whole demo so I don't know). How far are they from the edges of the "road"? Are there any obstacles or other vehicles nearby? If so, which ones? Where will they be in the next snapshot if they continue their current velocity? Should they apply brakes? Accelerate? Steer left or right? And that's just to maintain a course around the track. They demonstrated that each vehicle can also be given mission parameters. "Block that other car". Now they need to calculate even more than just what they are doing, they need to also sense the position of the other cars and calculate what they are doing, and then calculate a reactionary move to foil the opponent. Now they have multiple levels of operation -- level 1 is "survive" (e.g. don't crash or fall off the track), level 2 is "fulfill my mission". Did I mention this was all happening 500 times per second? And all being calculated on an iOS device? Presumably one iOS device controls each vehicle. So there is a steady stream of chatter going back and forth over Bluetooth. The vehicle probably sends up telemetry about what it sees/senses, then the iOS app calculates what it thinks the car should do next, then sends a command back via Bluetooth. I was really pulling for them when their showcase had a glitch. Glad they got to finish the demo. Hay Anki, how was the half-million dollar coffee meeting? I don't think the real point was the toys... It was more about the future. Robotics and such would have incredible uses way beyond toys. I remember using one of these about 8 years ago as a kid thinking "how can it get any better than this"? Now, less than 10 years on, we've got artificially intelligent robot cars using my phone (which weighs less than an apple) as their brain, racing round on a roll up mat. A ROLL UP MAT. Stuff like this may only be "novelty" and not have a massive impact on every day life, but it really is a brilliant demonstration of how amazing technology is. What an exciting time to be alive! The concept is great and the cars are a neat way to demonstrate the possibilities in a very comprehensive way. Having said that, the guys did come across like homebrewers than a professional business, everything from the second they rolled out their race track mat to the awkward tech fail break. Tim Cook's lack of enthusiasm in "they will be very successful!!" afterwards didn't help either... all in all it probably wasn't the ideal timing for that segment of the show.